Dr Wayne Hancock (Southern Cross University, Australia) is an expert in all things macadamia, but has a special interest in macadamia cultivar breeding and selection. 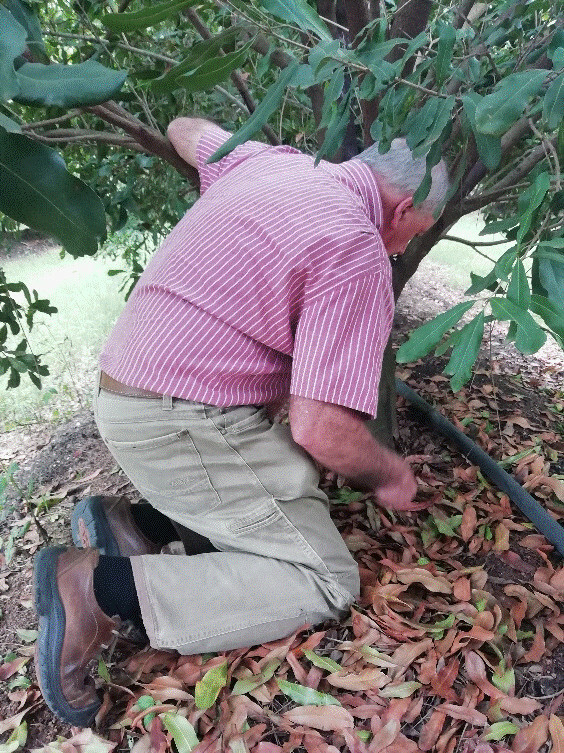 Dr Hancock recently visited growers and nurseries in Mpumalanga during a short visit on his way to Malawi, where he is involved in the development of the local macadamia industry. He also met with Mr Mark Penter from the Agricultural Research Council-Tropical and Subtropical Crops to discuss SAMAC's cultivar trials. The majority of macadamia cultivars used in South Africa are of Australian and Hawaian descent, with the South African industry dominated by Beaumont. South African selections such as the Nelmac series are also used to a smaller extent, with the Australian "A" series and more recent Hawaian selections such as 816 becoming more important. Dr Hancock expressed his concern over the over-reliance of the South African industry on specific cultivars (Beaumont), and stated that with the progress in technology, a marker-assisted breeding programme will be possible in South Africa in the coming years. This will be very important for producing cultivars that perform well in the different geographic locations, and to enable the South African industry to adapt to the effects of climate change. Dr Gerda Fourie who heads the Macadamia Protection Programme at the Forestry and Agricultural Biotechnology Institute at the University of Pretoria, Mary Ranketese, a PhD student working on macadamia cultivar genetics, and Dr Elrea Strydom, SAMAC R&D manager accompanied Dr Hancock on this very informative trip, and were also fortunate to attend a talk by Dr Hancock at the Forestry and Agricultural Biotechnology Institute.